This is a new one for me folks, but President Bush laid the groundwork for Ebola quarantines in 2003, And it was amended on July 31 2014 to contain terms which will allow them to just nail anyone now, Ebola or not. Read it and weep folks! 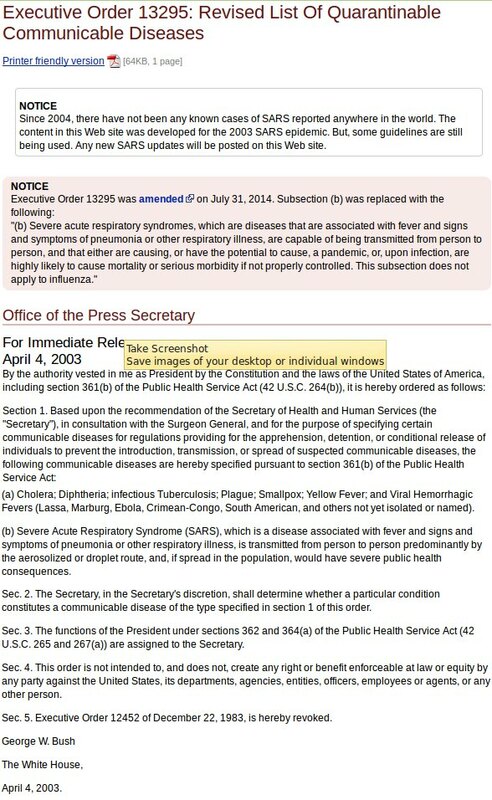 The testimony of Ebola being delivered via injection in Africa is posted alongside and immediately below this top posted Executive Order or Click Here. This testimony got banned on all the blogs and forums, IF ANYONE HAS THIS POSTED NOW, THEY ARE LEGIT. BANS WENT INTO PLACE IN MANY PLACES TO KEEP IT FROM GOING VIRAL. If you do not want an Ebola disaster, ARCHIVE, POST POST AND REPOST THIS MAN’S TESTIMONY, IT CAN BE THE DEATH BLOW FOR THE EBOLA SCAM. They can run whatever scam they want in the media, but if most of the world’s governments opt out on mandatory vaccines, the scam will fail miserably. This article was first published on http://jimstonefreelance.com/.